As profiled in Skinnie Magazine. All hyperbole aside, rapper Planet Asia is by no means an unknown stranger in the rap game. Planet Asia has made a name for himself by relentless touring and putting out various records and 12 inch singles since 1997, earning himself a reputation as one of the best rappers in the underground hip-hop scene. “The Medicine,” which is set to hit stores on 10/3/06 is his most anticipated work to date. The record is the final chapter of his “Medi-Cali” trilogy of albums, joining “The Diagnosis,” and “The Sickness.” While the first two in the trilogy were essentially mix tapes, “The Medicine” is a full-fledged album. Planet Asia was born Jason Green in Fresno, Calif., and the transition from Green to Planet Asia was not by accident or happenstance. It’s a name that conveys many ideas, images, and, of all things, a subtle reference to Pangaea. In what may seem to some to be a surprising move, Planet Asia will be touring a mixture of festival and club dates in Europe immediately following his record’s release. According to Planet Asia, the fans over in Europe are on a whole other level, as compared to hip-hop fans stateside. Now, now, don’t get upset, you US hip hop fans, all Planet Asia means is that perhaps fans over here are a bit spoiled only because they get to see their favorite artists all the time. In fact, Planet Asia says that to see him, all you have to do is just be in California, and odds are you’ll run into him. Planet Asia earned his rep in the underground rap world as an MC known for his specific, crisp delivery, a skill he’s been honing since he was a little kid. It’s a style that’s both eloquent and ominous all at the same time, reminiscent of fellow underground hip-hop legend, Cool Keith. Unlike a lot of people who get on the mic, Planet Asia is always aware of the distinction between projecting with a loud, intense delivery, all while making sure that people can understand what he’s saying. 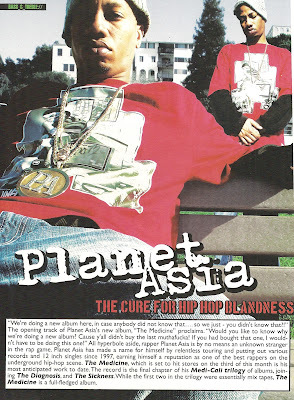 The hip-hop underground proved to be a good fit for Planet Asia as he was starting his career. As a prolific and talented artist, Planet Asia has never been what he calls a “record company rapper.” He became a self-contained artist who would book his own shows, and wasn’t directed on a whim by the marketing department of a major label. It was a place and situation where Planet Asia flourished. He joined up with fellow Bay Area rapper Rasco, who put Planet Asia on his album, “Time waits for no man” (which was one of the biggest independent rap album of its day), forming a collaboration with the two that lead to formation of their group, Cali Agents. The Cali Agents released their first album, “How the West Was Won” in 2000 to widespread acclaim. 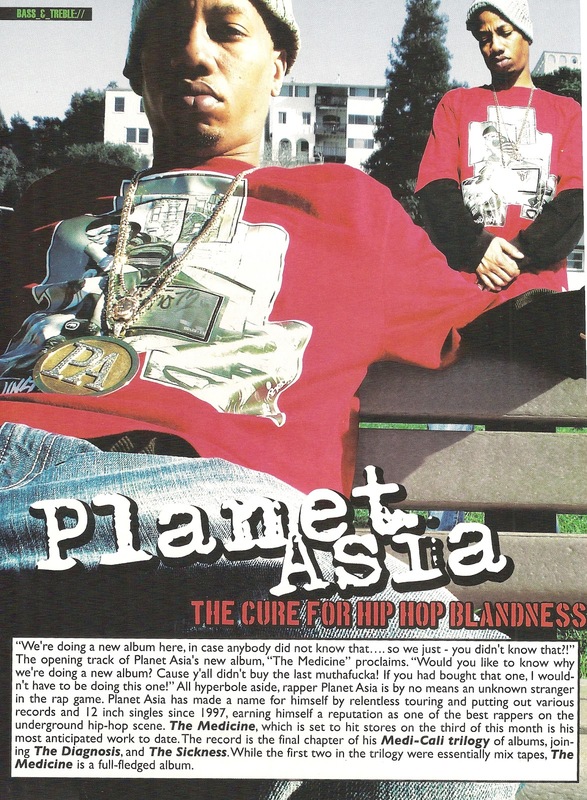 In 2001, The Source listed Planet Asia as a “First Round Draft Pick,” and “How the West Was Won” earned an Independent Album of the Year award. In that same year, Planet Asia was signed by Interscope Records, beginning a three-year relationship with the company, during which time, Interscope did not put out even one Planet Asia album. It must’ve been frustrating for a young artist to be on one of the largest labels in the industry, yet getting lost in the shuffle on a talent roster that boasted both Eminem and 50 Cent, right? At only 23 years old, Planet Asia got the opportunity to learn firsthand about publishing, mechanicals, and the ins and outs of the rap game that very few, if any, young artists had. During his time with Interscope, Planet Asia had the chance to travel and collaborate with other artists, and most of all, learned everything about the industry he could. “It was like going through college within the industry,” he says. After ending his relationship with Interscope in 2004, Planet Asia took all his knowledge and experience of being on major label, without being played out by a major label to form his own record company, “Gold Chain Music,” which is putting out “The Medicine,” an album he predicts will take underground hip-hop to a whole new level.